Overall Rating: 8 - great fun! Phebus Creations is a French garage manufacturer. 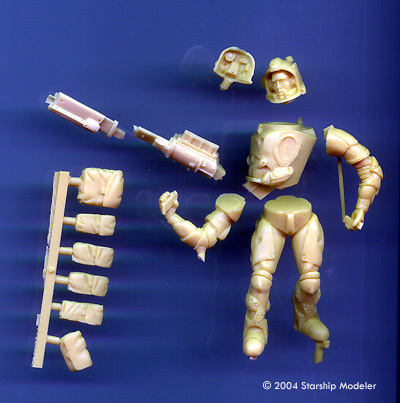 They offer an extensive line of figures ("real", fantasy and sci-fi), plus kits and conversions for sci-fi and armor subjects. 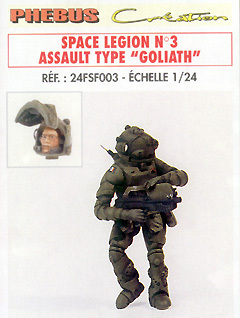 One of these figure lines is their "Space Legion" series, which includes 1/24 scale human and alien figures in many different poses, robots and some vehicles. 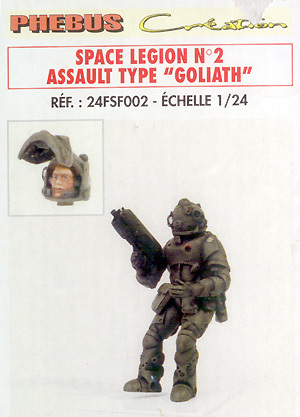 There are heavily armored human soldiers in "Goliath" assault suits, more lightly protected "Valkyrie" suits, plus the alien "Niameck" in heavy armor. I had stumbled across one of the Goliaths at Wonderfest several years ago and didn't realize there was such an extensive variety. I am quite pleased how that one turned out, and I like the look of the armor, so I was quite happy when Alain contacted me about reviewing some. Each kit comes in a small, sturdy box containing a baggie full of resin .... and nothing else. No instructions, no decals. The resin is very well molded; out of 7 kits so far, I have only seen a few slight mold seams that disappear with a few quick passes with the sanding stick. No other flaws - none of the bubbles, pits or flash that you expect with resin. The resin itself is somewhat brittle - it looks and feels a lot like the stuff Verlinden used to use. All the kits I've seen were slightly slick to the touch with mold release, so a bath and a good scrubbing with a toothbrush is in order before you do anything else. Detail is quite good on all. Each kit comes with a weapon of some sort, storage pouches and all the kits I've seen have the option to show the face, or cover it with a helmet visor. (I especially like the representation of the aliens' faces). 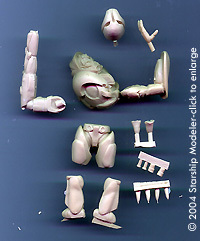 Torsos and heads are generally the same from kit to kit, with the legs and arms in different positions. 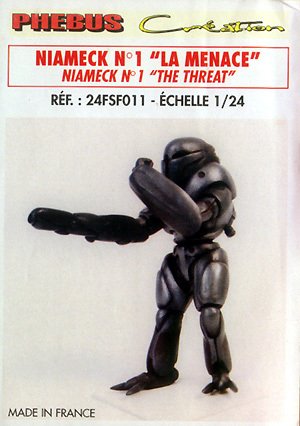 If there's a downside to these, it's that the poses are rather stiff .... but then you'd expect to be stiff if you were wearing bulky battle armor, I suppose. The kits go together easily and quickly. The lack of instructions isn't really a problem - parts fit is pretty intuitive. 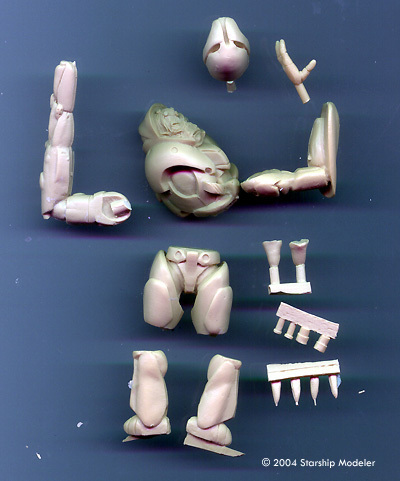 The unpainted figure shown at left took me 20 minutes to assemble to the point it was ready for paint (and that includes scrubbing the pieces witha toothbrush and Dawn dishsoap). Casting stubs are generally small and easily removed, though because of the brittleness of the resin you might want to use a razor saw instead of dykes or sprue nippers to do so. The pieces fit with no - or at most, very small - gaps. I used gel type superglue which oozed out just enough to fill any slight gaps. Small pouches were glued on whereever I thought they looked most logical. The completed figure shown at left was assembled the same way, though I added on some spare photoetch to detail his backpack a bit more. I used an automotive lacquer primer (from a spray bomb) as a basecoat. I find these generally adhere better to resin than hobby enamels or acrylics and provide a good foundation for whatever you want to use as color coats. You just need to let the paint cure for a day or so to make sure no unevaporated carrier or uncured paint will cause your next coats to bubble up or craze. 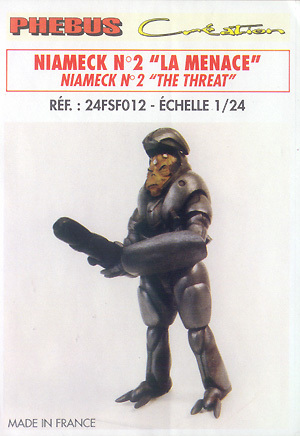 I airbrushed Gunze "Gunmetal" acrylic over the figure, then hand-painted all the details. The face was done with acrylics and followed by an oil wash. If you haven't guessed, I like these figures. They're easy and fun to build and paint, and offer a lot of possibilities for dioramas. They're simple enough for even a novice to do - and if you're not confident about painting the face, you can always cover it up with the helmet's visor. Highly recommended! Phebus' website appears to be down as of this writing, though as far as I know they may still be contacted via eMail. I have since found several on-line figure/miniatures retailers that carry some or all of their lines via Google. Many thanks to Phebus Creations for providing the review samples (and many more apologies for taking so long to write this!). Manufacturers and retailers, interested in getting your wares reviewed and publicized on a site averaging 3500+ readers a day? Contact us! This page copyright © 2004 Starship Modeler. First posted on 27 July 2004.